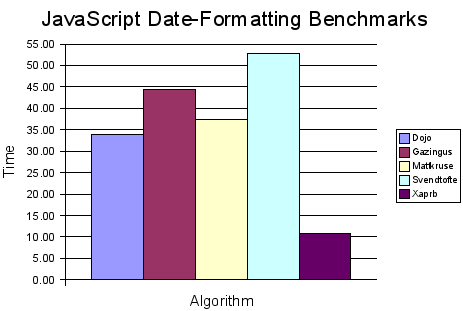 I’d like to benchmark my date-parsing library too, but I haven’t seen any comparable implementations. By the way, my date-formatting and date-parsing libraries are wrapped into a single file, so even though I’m not actually executing the date-parsing functions in this benchmark, they’re compiled anyway. Note that my motivation also isn’t to make the fastest date formatting code. I haven’t really tried to optimize for speed, but if I wanted to, I think I could probably find some bottlenecks and optimize my own code further. All I’m trying to do is demonstrate the general coding methodology I used, because I often see folks using a much less optimal solution, probably because they don’t know about (or aren’t comfortable with) dynamic code generation. That’s just my opinion. I ran these benchmarks on Firefox 1.5.0.2 on my home computer, a fairly new and powerful AMD64 machine running Gentoo GNU/Linux. I won’t bother telling you all the hardware specs… that always makes my eyes glaze over. I had to increase the script timeout so Firefox wouldn’t interrupt the tests. I did this by opening about:config, then changing dom.max_script_run_time to 5000 seconds. Obviously, the method I use is much faster—between 3.15 and 4.89 times faster. Here are the results as numbers in a table. WARNING: If you click on the links to the benchmarks, your browser will probably freeze for the better part of a minute on a fast machine—maybe longer on a slow machine. Is this an apples-to-apples comparison? Absolutely not, and if it were, the slowness of the other methods would be even more obvious. First of all, I’m only testing a single method of formatting—producing a date in YYYY-MM-DD format. I also haven’t been scientific enough to really be accurate. Beyond that, though, these various bits of code I’ve benchmarked are vastly different. The one that provides the most similar formatting functionality to mine is Svend Tofte’s (that’s probably why it’s the slowest), but even that one only does parsing, not formatting (mine does both). The others are much less fully-featured, which means they’d probably be even less performant if someone extended them to implement the same set of functionality. As I said above, I’m not doing this to pick on anyone, but the Dojo method is probably the least efficient. It’s the simplest of all, providing only a few formatting characters, and it’s not really that much faster than Svend Tofte’s implementation. It’s probably so slow because it a) uses lots of if statements and b) uses repeated string replacements with regular expressions. This is just a hunch, but if it had the rich feature set of my implementation or Svend Tofte’s, I think it would probably be the slowest by far.